A glossary of gutter parts. 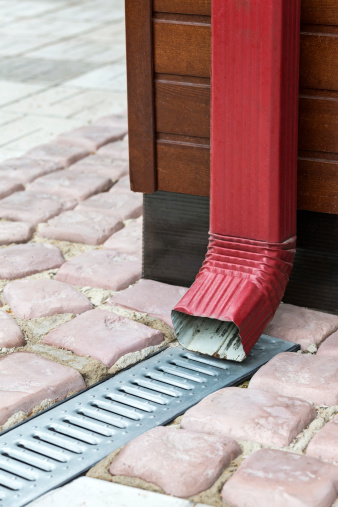 Like every aspect of your home, your gutter system has its own set of terms and parts. If you’re going to be installing your own gutters, you’ll have to obtain all the adequate materials. And if you want to get the job done right, there’s more to this task than purchasing guttering and grabbing a handful of screws. gutter section – also called simply a “gutter,” this is the horizontal length of guttering (usually between five and ten feet) which attaches to the home. Runoff water and snowmelt falls into the gutter sections. downspout – a vertical, enclosed pipe which is attached to the side of the home. It has one opening at the top and another at the bottom, into and out of which runoff water flows. hanger – the piece which (along with a screw) fastens the gutter section to the home. hidden hanger – a type of hanger that sits inside the gutter section near the open mouth so that it cannot be seen from below or in front. It consists of a bent piece of metal with a hole in one side through which the screw goes into the eave. The other end of the hanger is braced against the inside front edge of the gutter section to give it support (and can also be screwed to the gutter section if needed). ferrule – a small, cylindrical piece of metal that facilitates a different way to fasten a gutter section to a home. A long screw passes through a hole in the front edge of the gutter into the ferrule, out the other end, and through the gutter section’s rear edge into the eave. end cap – the end piece of a gutter section that keeps stray debris or water from flowing out of the guttering. It’s usually a flat piece of metal shaped like the gutters that attaches directly to the ends of the sections. It can also be screwed into the eave. miter – the term for a “cornering” gutter section. Sometimes, these are pre-fashioned pieces, often called box miters, that attach to the gutter sections on either side. There are also strip miters or bay miters, which are small, skinny pieces of metal that serve as fasteners between two gutter sections at a corner. elbow – a bent piece of pipe which goes on the end of a downspout. The elbow can either be at the top of the downspout to join the gutter opening to the downspout opening, or placed on the bottom of the downspout to direct water away from the home’s foundation. pipe cleat – a fastener that affixes the downspout to the side of the home. It’s a bent piece of metal that resembles a “clip” that is placed around the outside of the downspout, and screwed into the siding or brick of the home on either side of the downspout pipe. Before you begin the work you should gather the materials needed and ensure you are well-versed in the techniques and procedures associated with hanging gutters. Otherwise, you may spend a lot of time installing gutters that don’t function well and/or look bad. Check out some instructional videos on the Internet as well as articles to help you decide if you should hang your own gutters or hire a pro. If you opt for the latter choice, contact Harry Helmet for a free, on-site estimate today.